Vehicles now interact with explosions in a different way, too. Fortnite: Battle Royale’s v8.11 update patch notes are now live. The update should be ready to download in all platforms anytime soon with no server downtime, which means players will be able to check all changes introduced in this update right away. 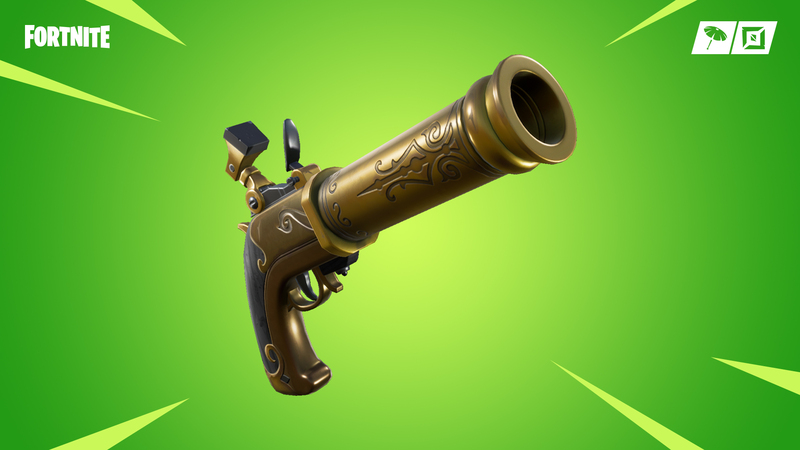 We had a few guesses of what was coming with v8.11 based on comments made by key community members and the announcement of the Flintlock Pistol in the in-game News tab. The weapon is really making its debut today without vaulting any other weapon. Here’s what changed in today’s Fortnite update. The Flintlock Pistol is now available in all default playlists and most game modes. It’s available in Common and Uncommon rarities and can only be found from floor loot. It deals 86 and 90 damage according to its rarity with “significant damage falloff.” It has one shot per magazine, uses heavy ammo, and has a three-second reload time. The new mechanic it introduces is knockback. The shooter is knocked back after using the Flintlock Pistol, and the target can also get knocked away. The closer your target are to the shot, the farther they get knocked back. If the shooter crouches, they avoid their knockback. The Impulse Grenade has been taken back from the vault with its impulse strength against vehicles increased by 344 percent. The general impulse strength of other explosive weapons against the vehicle has also been increased by 233 percent. Now vehicles like The Baller will be easier to repel. And along with that, The Baller’s spawn rate has also been reduced from 100 to 50 percent. The base damage of the Scoped Assault Rifle has increased to 27/26 from 24/23. That seems like too little, but it means players should now take four shots to take down an opponent with no shields instead of five. Epic introduced a brand-new tournament with prize money. Gauntlet Test Events are back and the top three percent players in them will guarantee a spot at the Blackheart Cup on March 23 and 24, with $100,000 in prizes. The full rules of the event will be released later this week. All players should be able to jump into their matches in v8.11 after they install the update at 4am CT today. The full patch notes are available at Epic’s website.